Get the EMX IRB-MON specifications and installation/owners manual pdfs by clicking the download buttons. Or, see the information below to learn about features and specifications without leaving this page. The IRB-MON provides a universal solution for entrapment protection. One photoeye covers the entire spectrum of possible requirements for monitored and non-monitored photo eyes, simplifying inventory management and product training. The IRB-MON is an external entrapment protection device type B1, non-contact sensor for use with automatic gates and doors. The device is UL325-2018 compliant and suitable for use with both operators that require monitored entrapment protection and those that do not require monitored operation. 1. Normally closed: Cycle power to the transmitter while monitoring the receiver contacts for proper operation. 2. Two-wire pulsed (2 freq): Provides 300Hz “heartbeat” unobstructed, 0Hz obstructed over power supply lines. 3. Three-wire pulsed (3 freq): Provides 300Hz “heartbeat” unobstructed, 2Hz obstructed and 0Hz failure over power supply lines. 4. Resistive termination: Provides a 10k Ohm resistance when unobstructed. The long range and thru-beam features combined with the installer mode switch settings provide a flexible solution to all external entrapment protection needs. 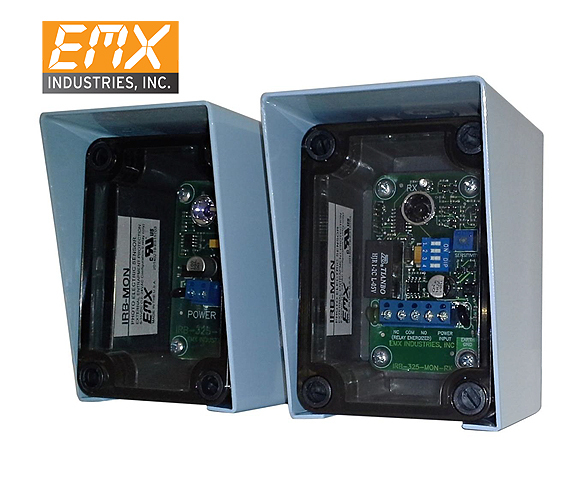 A robust, NEMA 4X enclosure provides the durability required for high-reliability entrapment protection applications. Lens-less design minimizes fogging and false triggering caused by small objects and provides for easy alignment. The major advantage of the IRB-MON is its flexibility; this photo eye covers the whole spectrum of UL situations. • Non-monitored UL325 2018 compliance for the gate operators. • Monitored application per UL325-2010 as applied to overhead doors operators. Only one photo eye is needed to cover all these applications. The IRB-MON is a monitored, weather-proof, thru-beam infrared photoeye solution providing entrapment protection for doors, gates and barriers. The IRB-MON Safety Photo Beam is UL325-2018 compliant and housed in a rugged NEMA 4X enclosure suitable for indoor and outdoor use. Robust: suitable for high-reliability entrapment protection applications. Lens-less design minimizes fogging and false triggering and provides easy alignment.